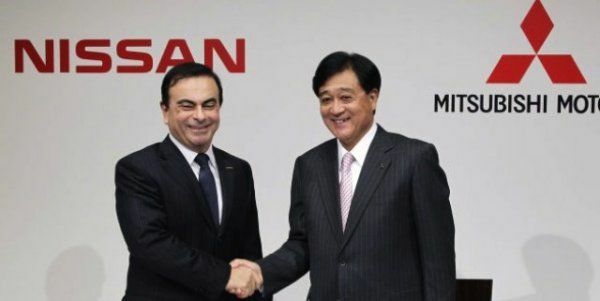 Nissan and Mitsubishi have had a cooperative agreement for some time, resulting most recently in the new Nissan Dayz and Mitsubishi eK vehicles that entered the Japanese market this year. A new agreement, penned yesterday, continues the NMKV joint venture, but includes Nissan alliance partner and majority shareholder Renault in the mix. The agreement extends what was already in place to add co-development of a new small-segment car with an electric version. That small car will be global rather than regional, potentially bringing a new Mitsubishi/Nissan car to the United States. The car's basis will be the already-developed "Kei car" platform already now under production in Japan. This agreement further gives Mitsubishi access to some of Nissan's electric vehicle technology and product assets, which would extend Mitsubishi's portfolio in zero emission products and give Nissan access to some of Mitsubishi's technology patents in that regard. The NMKV joint venture says that the first thing to be seen publicly from the new cooperative are two new sedan models under the Mitsubishi brand, both of which will come from the Renault portfolio of vehicles. That will mean a new full-sized (D-segment) vehicle for North America under the Mitsubishi name, though it will be imported from South Korea, and a second, smaller (C-segment) sedan for global sales (including North America) at a later date and manufactured at an as-yet unknown location. The other, smaller vehicle could be anything at this juncture, but will likely be at least based on the Renault Samsung Motors SM5 or SM3 cars, though it could be from the Nissan lineup, already under manufacture here in the States, as well. The small car with an EV variant is likely to be based on the Dayz/eK collaboration. These subcompact Kei-car style vehicles are very popular in Japan and are beginning to be seen here as models like the Chevrolet Sonic, Ford C-MAX, and of course the Nissan Versa Note and Cube. This could see an electrified Versa Note (the LEAF is already bsed on the Versa platform) sold as either a Mitsubishi model or as both a Mitsu and Nissan model here. For Mitsubishi in particular, this new alliance with plans for North American product introductions could be the saving grace that keeps the company viable in the U.S. Mitsubishi has been struggling for market share here for decades, but recent introductions such as the all-new 2014 Outlander and improved sales for the Lancer Evolution have given new hope that the struggling automaker may keep its toe-hold in North America. A new, mainstream product in the large sedan arena could be the boost they need to stay on our shores. For Nissan, of course, this brings expanded opportunities for collaboration in technology in markets outside of the U.S. and the addition of alliance partner Renault here means further inroads into production sharing and perhaps further market expansion in critical areas globally. Expect to begin seeing product announcements from both Nissan and Mitsubishi within the next two years.